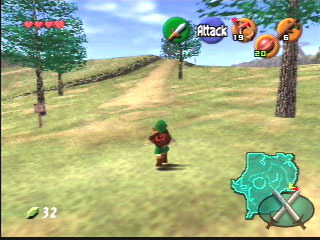 The first Zelda game on the Nintendo 64. You start off as wittle boy and stuff happens. I don’t wanna give too much away, so off we go. Graphics: Ooooohhhhh, purdy. Look, I’m in a very well done 3-D world with day and night. And I, I can actually see what is ahead of me where I’m going. Wow. Plot/Linearity: I don’t wanna give it away, so I’ll just say, there is a plot. Battles: Very well done. I thought it would be hard to fight with a sword in this 3-D world, but the game designers did a very good job in making battles easy. The Z-targeting system was one of the best features in the game. Music/Sound: Classic Zelda music with stereo surround. Oooooooooooooo. Gameplay: The game was fun to play. But this is where the problems for Ocarina kick in. First off, the game is pretty easy all the way through except for a couple of dungeons (oh dear God not the Water Temple!! Please don’t make me fight in there again!! I beg you!! If you have a soul you…..nooooooooooooooooooooooooooo!!) The dungeons were either very easy (most) had a couple of hard puzzles (some) or were insanely hard (some a.k.a. the Water Temple). Also, that little fairy told you every damn thing you needed to know how to beat the game. (Link, go here, Link play your flute, play this song, do this do that, not that you fool!!) It really pissed me off that she was too helpful. Also, the bosses were easy, especially Ganon. But, there were some good aspects too. The game is still fun the play. I especially liked playing the thieves area where you had to navigate your way around without getting caught. And there were plenty of things to do in the big world map, plus you got a horsey to ride. Finishing: This was a good game, but it coulda been a lot better and harder. I’m still waiting for Nintendo to make a Zelda game as hard as the first one.